In 2010, the IBM Center for the Business of Government awarded a grant to the UB Regional Institute to investigate the effectiveness of current models for environmental collaboration across international boundaries in North America. The research program evaluated selected case studies of cross-border environmental collaboration along the northern and southern boundaries of the United States. 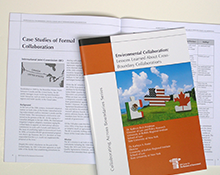 The research article, “Environmental Collaboration: Lessons Learned About Cross-Boundary Collaborations,” was published in February 2011 in the center’s “Collaborating Across Boundaries” journal series. The effort is part of a series of research efforts sponsored by the center to advise local, regional, state and federal government officials with practical strategies for moving forward on cross-boundary collaboration in diverse policy areas. This entry was posted on October 6, 2014 .